Only a few months into her postdoctoral fellowship with Ocean Leaders at UBC, Dr. Sarah Rosengard has embarked on a trip to initiate her new research. Working with a team headed by Dr. Philippe Tortell from UBC, Ron Kiene from University of South Alabama and John Dacey from Woods Hole Oceanographic Institution, the team travelled from Alaska to Portland by ship to collect measurements of the ocean’s light properties, which depend on the algae living at the surface. Satellites also image the ocean’s light properties, providing us with valuable information about the ocean, but interpreting that data can be challenging. “Satellites provide a surface picture of the ocean you can’t get from ships”, says Rosengard. By assessing the light properties of the ocean and linking that to satellite imagery, Rosengard is hoping we can “increase our confidence in what satellite data is telling us” about the algae. By better understanding satellite data, scientists will be better poised to answer big picture questions about ocean life. Sarah graduated from the MIT-Woods Hole Oceanographic Institution Joint Program with a PhD in Chemical Oceanography. 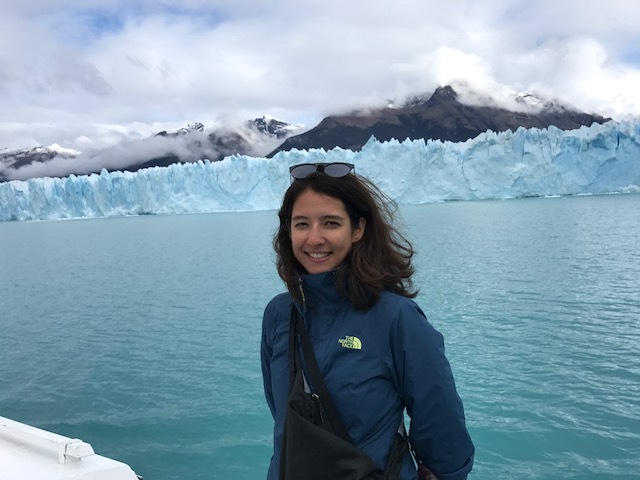 Her work focused on examining the transfer of and chemical changes in particle organic matter in the Southern Ocean around Antarctica and the Amazon River. Curious about how carbon could be locked away from the atmosphere for extended periods of time, her later work investigated the processes that deliver carbon-rich particles from the Amazon River Basin into the coastal Atlantic Ocean, where they can be buried on the sea floor for hundreds to thousands of years. After completing her PhD, Rosengard sought opportunities to conduct further research while getting more experience with science communication and exploring interactions between science and policy. During her PhD program, Rosengard co-founded a peer group called “Broader Impacts Group” focused on improving skills in writing and speaking in order to better communicate scientific developments. “I like being able to connect with the public”, Rosengard says, “and Ocean Leaders provides an opportunity to explore that further.” Rosengard explains that this is also what makes working with satellite data so impactful. “The visuals are so striking and they can be inherently profound to non-scientists and the general public”, says Rosengard. These may provide inroads to greater public awareness and engagement on ocean life and the scientific community.